Cicindela denverensis (green claybank tiger beetle) | Sioux Co., Nebraska. Here are a few more photographs of the insect featured in ID Challenge #1, which is, in fact, Cicindela denverensis (green claybank tiger beetle). Nearly every commentor got the first 6 points easy enough (2 pts each for order, family, and genus), but only Ben Coulter correctly identified the species. A bonus point for proper italicization of the binomen (and a favorable ruling on a technicality) gave him 9 points and the win. Second place goes to TGIQ, who smartly picked up bonuses to earn 8 points and edge the pack. Charley Eiseman, Christopher Taylor, Delbert La Rue, jason, and Techuser crowd the final podium spot with 7 points each. Distinguished by its green color, hairy frons, reduced maculations, and grassland occurrence. Cicindela denverensis occurs in short- and mixed-grass prairie habitats in the central and western Great Plains, especially sites with clay soils. It can be distinguished from a number of similar-looking species by its uniformly green color, hairy frons, often reduced maculations, and occurrence in grassland habitats. Cicindela sexguttata is also uniformly green, but the frons in that species is glabrous, and it occurs further east in woodland habitats. 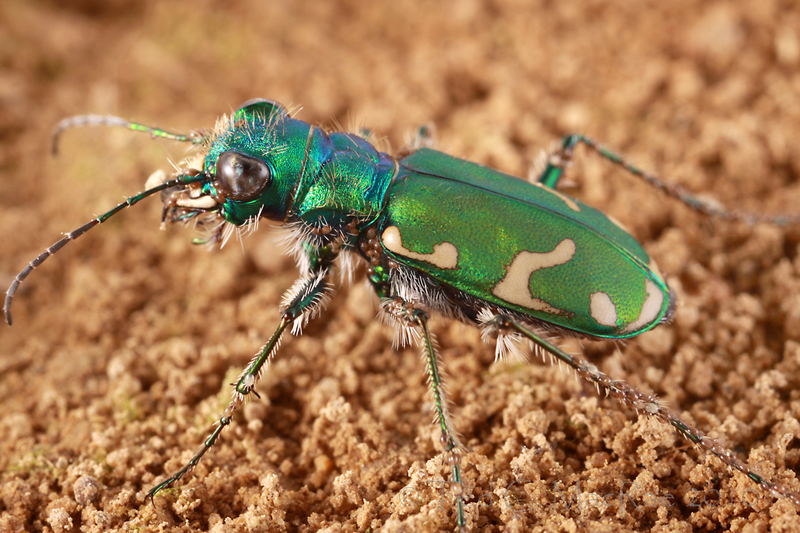 Cicindela decemnotata is also similar, but it usually has broad maculations and a shinier, oily appearance – often with some degree of red tinting. Some subspecies of C. scutellaris are also green, but only rugifrons bears maculations and can be distinguished by it’s stockier form and Atlantic Coastal Plain distribution. 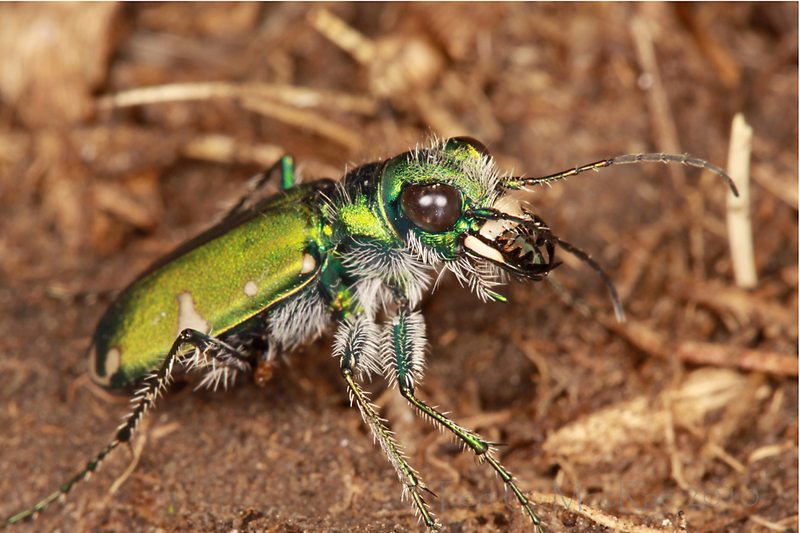 Cicindela denverensis is actually most closely related to C. purpurea (cowpath tiger beetle), C. limbalis (common claybank tiger beetle), and C. splendida (splendid tiger beetle) – especially the latter two. All three of these species exhibit some degree of purple or red on the pronotum, elytra, and/or legs that distinguish them from C. denverensis in most parts of their range. There is, in fact, some disagreement about whether C. denverensis, C. limbalis, and C. splendida even represent distinct species, all of which demonstrate a similar preference for clay substrates but segregate into three partially allopatric populations – northern C. limbalis, southern C. splendida, and western C. denverensis. Hybrid individuals can be encountered in areas where their distributions overlap, and this is especially so in central Nebraska – one of just a few spots where all three species occur together. Schincariol & Freytag (1991) conceded a close relationship between the three based on morphometric analysis but still considered them distinct based on differences in elytral color, pattern, and percentage maculation and the number of non-sensory setae. However, a recent phylogenetic analysis based on mitochrondrial DNA sequences strongly supports a single species hypothesis (Woodcock & Knisley 2009). From an academic perspective, more thorough systematic analyses of the claybank group of tiger beetles would be of great interest (although I suspect many cicindelophiles with strictly philatelic interests will not be happy to see three species sunk into one). Ponderosa pine mingles with prairie grasses on the Nebraska Pine Ridge escarpment. 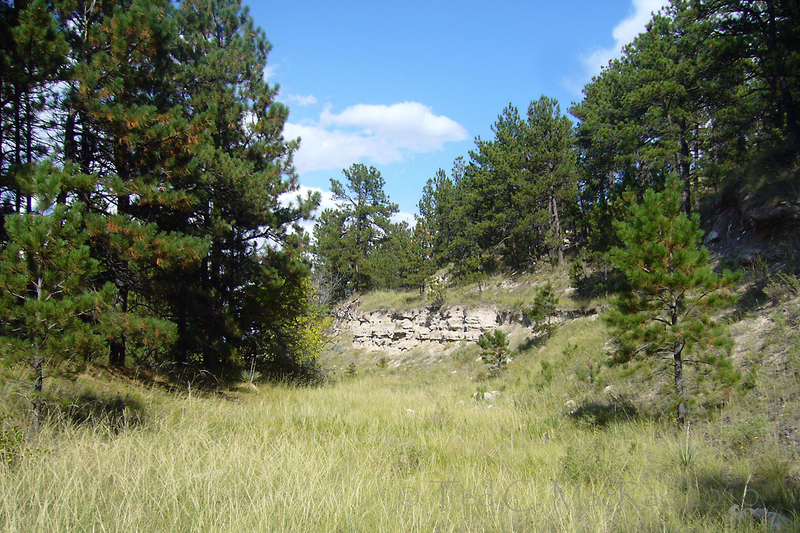 The individual in the above photos was found at Monroe Canyon in the Pine Ridge escarpment of western Nebraska (Sioux Co.). It was the only individual of this species that we saw there and was a bit of a surprise finding because of the generally sandy soils that characterize the spot – perhaps it was a vagrant individual that had found its way into the canyon from the more clay-based shortgrass prairie above. We’ve seen greater numbers of this species further east in central Nebraska (Sherman Co.) along vertical roadside clay banks. The photograph below is one of those individuals and exhibits somewhat more complete maculations. Note the sharp bend, or “knee,” on the median maculation that allows the species to be differentiated from C. limbalis (all-green forms of this species can be found at the northern limit of distribution for C. denverensis in North Dakota). This individual also displays something else of interest – anybody? Individual with more complete maculations | Sherman Co., Nebraska. Schincariol, L. A. and R. Freitag. 1991. Biological character analysis, classification, and history of the North American Cicindela splendida Hentz group taxa (Coleoptera: Cicindelidae). The Canadian Entomologist 123(6):1327-1353. 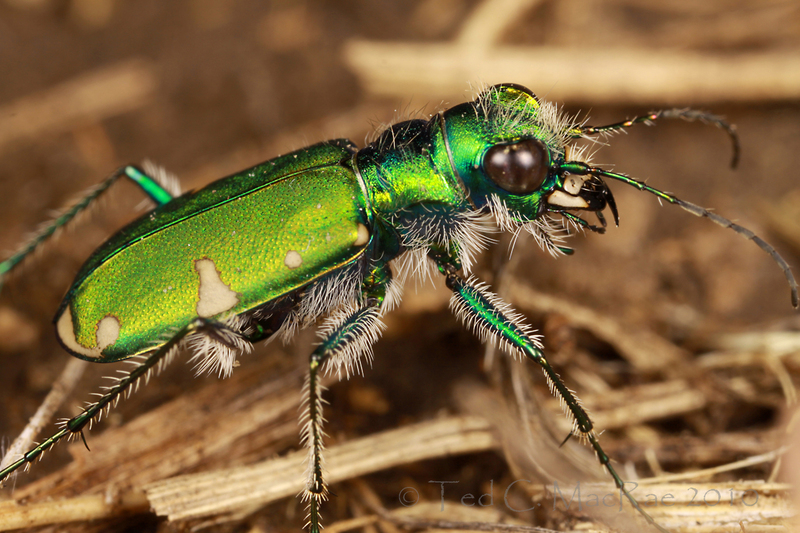 This entry was posted in Cicindelidae, Coleoptera and tagged beetles, entomology, insects, nature, Nebraska, science, taxonomy, tiger beetles. Bookmark the permalink. Looks like a Mite-y good specimen to me! Morgan beat me to it – Mites on the pro- and mesopleura. Check out the rear tibiae as well. Wow… A lot of mites. Everywhere. Great photos, Ted, and it’s nice to learn more about this species. One thing your ID challenge makes clear is how limited my identification ability is when I can’t see the whole critter (or plant or whatever). That’s something I need to work on, so your challenge is a good step in that direction. Gracias, dude! Thanks, Jason. Tiger beetles are one of those groups that seem easy, because in any given location the species present seem quite distinct from each other. However, when you start considering them in broader geographic context there are a lot of species that have very similar-looking counterparts. Don’t beat yourself up too much – Cicindela sexguttata was the species I expected most would confuse it with. btw, I’m not so enamored with these photos – the flash just wasn’t accurately capturing the brilliant green coloration with the diffuser setup I was using at the time. The last photo was taken with the confined in a terrarium placed in a white box and using indirect flash – while better, the colors still seem a little off. The face-on shot in the ID Challenge post was the only one that I really liked. Not sure why I am labelled anonymous above (maybe here, too) but it’s James again. I find it gratifying that I at least was given pause by all that hair on the face, but I had to go with sexguttata for lack of familiarity with any others so green. Comments are tagged ‘anonymous’ if you’re not logged into WordPress and don’t provide your email address.